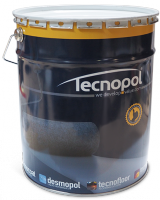 DESMOPOL T is a one component high solid, polyurethane resin, which once made forms a continuous, elastic, without any joints or overlapping, and totaly waterproof. It is applied manually, using a roller or brush and, exceptionally, using specific spray equipment. Waterproofing and coating of: roofs, terraces, balconies and overhangs.